"Horses and life, it's all the same to me." "Confidence is knowing you’re prepared." "Why does it take a lifetime to learn to live a lifetime?" "In difficulty, there is opportunity." Silver Spade Ranch offers full care boarding to those who are dedicated to improving their horsemanship and are currently enrolled in training or lessons with Donohue Horsemanship. The ranch also has a thriving pature raised, grass fed beef program. We offer a limited number of cattle for sale by the quarter, half or whole every fall. We are producing some of the best beef in Washington county high in Omega fatty acids, flavor and tenderness. Our 80’-144’ indoor arena has sand footing, is watered and groomed regularly, and has two spacious elevated viewing/seating areas. We also have an outdoor 60’ round pen with all-weather footing. The 12’x12’ horse stalls have rubber mats, wood pellet bedding, adjustable-height side walls allowing horses to socialize with their neighbors when possible, and open air stall fronts, to provide as open and natural of an environment as is possible in an indoor box stall. Most of our 34 acre property is dedicated to large grass pastures, which were planted with a grass seed blend specifically designed for grazing horses. The horses are turned out in herds and are able to roam freely, graze, and socialize. Our turnout schedule changes year round, allowing for pasture rotation so that the horses are on quality grass as often as possible. For horses requiring a limited intake of grass due to veterinary recommendations, we have a dry lot pasture free of grass, so that these special needs horses can still spend time outdoors in a herd environment. We feed top quality grass hay and alfalfa from Eastern Oregon. Our grain and supplement program is customizable, to provide the best nutrition for your horse’s individual needs. We offer a variety of grains and supplements, including a joint supplement that is custom made for our ranch, made right here in Oregon, and designed with the help of our ranch veterinarian. If you would like to be on our grain program but your horse requires additional supplements that we do not offer, we can add them to your horse’s daily grain for you. Full care board includes daily stall cleaning and watering, twice daily feeding, herd turnout on our various pastures, space in one of our roomy and secure tack rooms, and use of our beautiful facility. Silver Spade Ranch also features a thriving pasture raised, grass-fed beef program. We offer a limited number of beef cattle for sale by the quarter, half, or whole every fall. 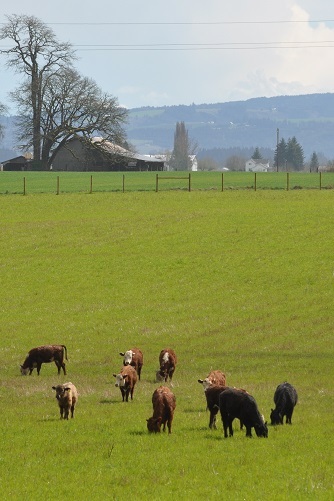 We are producing some of the best beef in Washington County, high in Omega fatty acids, flavor and tenderness. As part of our beef program, students at Silver Spade Ranch who are interested in learning about the process of raising livestock have the opportunity to do so, through our cow working and ranch roping clinics. We are a small family run semi-private boarding facility in Banks, OR. We specialize in teaching horsemanship, starting colts, and working with troubled horses. We have spent the past 12 years studying horsemanship with our mentor Buck Brannaman, pursuing what was taught to him by Ray Hunt and Tom Dorrance. In 2018 we will be taking in one outside horse to prepare for Working Cow Horse events, such as Stock Horse Pleasure, Stock Horse Trail, Stock Horse Reining and Working Cow Horse. If you are interested in getting involved in this, get in touch as we have a special offer for horses in training for these events. Copyright 2016.Silver Spade Ranch. All Rights Reserved.